Freedom quiz: Guess which one is Vietnam and which one is the US. Someone argued today that Vietnamese have more freedom than US Americans. So, let’s take a little test. A tourist could ordain himself “Grand Itchy-High Potentate” and open a tax exempt church. Farmers occupied the capital in July 2012, demanding the return of their farmland. Less than 1% of the population works in agriculture, and the government pays many of them not to plant anything. An older man, who I later found out was the village headman, invited my translator, Sheung Di and I to have iced coffee. He was just asking us why we had come to the village, when his phone rang, with a loud, Khmer ringtone. Finding the village was a bit of a trek. Once we came off the highway, we drove down the dusty back roads, frequently asking directions to the Khmer village. People gladly gave us long dissertations, such as “Go to the big stone. Turn right at the old tree. Drive toward the sun. Then ask again.” We repeated this procedure over, and over, until finally, Sheung Di slammed on the breaks. “This is it.” He said, pointing at a market stall. Sure enough, one of the first stalls we encountered had long strings of Khmer beef sausage dangling from the roof. Once we got out of the car, it quickly became apparent that my Chinese-Malaysian translator was mostly along for the ride and moral support, as I was going to have to do much of the talking, in Khmer. As we sat with our ice coffees, talking to the head man, this certainly did look like a Khmer village. Within seconds of our arrival, the head man pulled a smart phone out of his pocket and showed me a satellite photo, proving that Preah Vihear temple was, in fact, in Cambodia, and not Thailand. Yes, this was Cambodia all right. I thought, to myself. 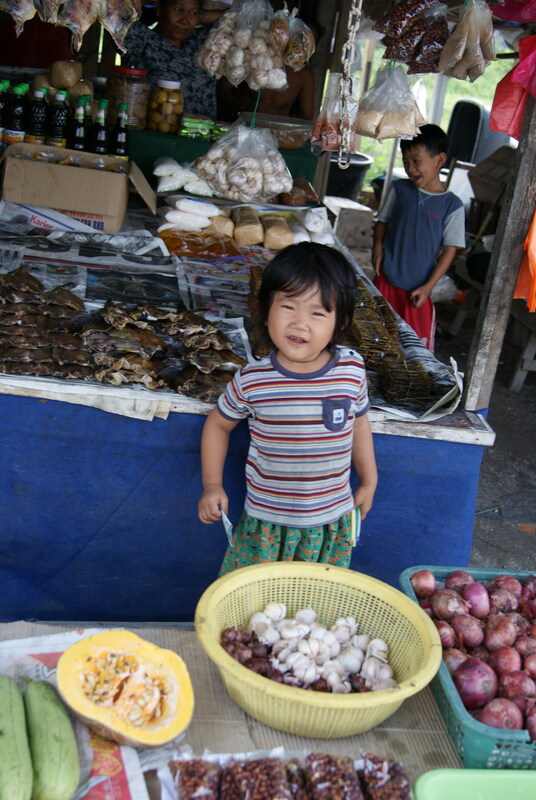 Sheung Di pointed out that the village sold dried fish and fish sauce which further differentiated them from the Malays. One thing that was different from Cambodia, however, was that no one was wearing any traditional clothing. I didn’t see Khmer krama or sarong, and almost none of the men were wearing Cham hats. In fact, a lot of the women were wearing Malay Muslim dress. They asked me if Khmer boxing was better than Thai boxing. I said it was the same. So they asked who could fight better. I said that Khmers had more heart but Thais had more equipment, food, and training. The villagers all nodded their approval of my answer. I had clearly dodged a bullet. Sometimes, even in Cambodia, I hear people using these words interchangeably, but they are very different. Khmer Islam should refer to Khmers who converted to Islam. Whereas Cham is a separate ethnic group. Legally, there is a tremendous difference between these two groups, in Malaysia. According to Malaysian law, all people are citizens who meet three criteria: are Muslim, speak Malay, and belong to the Malay race. Technically, they consider all Cham plus Muslim Indonesians and Filipinos to be Malay citizens. Perhaps the people were being vague on their ethnicity on purpose to obtain Malay citizenship. 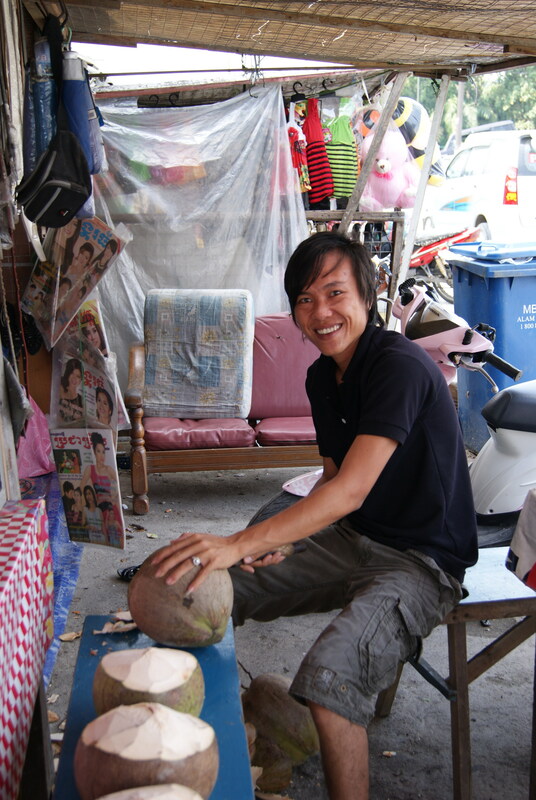 The headman told me that less than 50% of the community could speak Cham. He said that they had their own Khmer school. He was very proud, to tell me that unlike Khmer Surin, in Thailand, where the people are also of Khmer origin, everyone in this community could read, write and speak Khmer. Most of them claimed to know Arabic. It is not hard to believe that they would get better Islamic education in Malaysia than in Cambodia. In addition to Khmer, Arabic, and some Cham, the children all had to pass school exams in Malay. They had Khmer magazines and products flown in from Cambodia, and seemed to be up on all of the latest news and gossip from the kingdom. I rattled off the names of some of the popular bands and movie actors, and they all knew who I was talking about. When I mentioned Eh Phou Thoung, the headman suddenly said, “I know you!” He recognized me from Khmer TV and told the others that I was famous for Bokator and Khmer boxing. Then a few others said they had seen me as well. The interviews got easier at that point. The restaurant owner, a woman in her fifties, sat beside us, and told us how the village came to be. Eventually, the Muslims were told to cue up, and they could go to Malaysia and get citizenship. Technically, only Cham meet the three criteria for Malay citizenship, Speaks Malay, Follows the Malay customs, Is a Muslim. True Khmer Islam only meet the third requirement, “is Muslim”. But no one seemed to make a distinction. In theory, under Malay law, all Cham still living in Cambodia are actually Malay citizens and simply need to go to Malaysia to collect their rights. Sheung Di, who was born and raised in Malaysia told me that by local standards the village looked poorer than a Malay village. But I can attest that it was definitely richer than a Khmer village. Of course, looks could be deceiving. All of the people we met were sellers. They hung around the coffee shop all day, and then at night they went to market to sell. 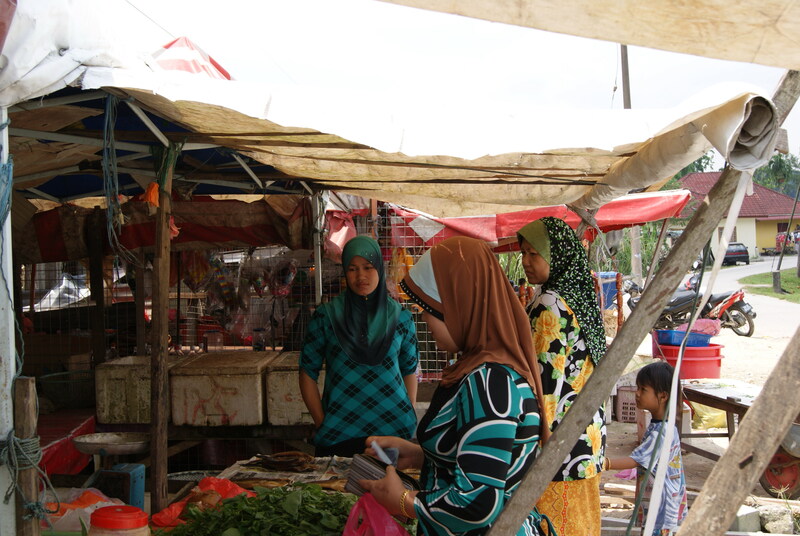 The headman told me, “The law allows us to have 4 wives like other Muslims in Malaysia.” Many of the men said they had two. They pointed at one man and told me he had ten wives and lots of girlfriends. “He’s always running around” the lady told me. I didn’t know if these were official wives or if they were just joking. “We can only marry many women if we have enough money to support them.” The headman clarified. The Malaysian society often fractures along ethnic lines. The population of 28 million, is composed largely of three ethnic groups: Malay make up 50.4%, Chinese 27%, and Indians, mostly Tamil, 7 %. An additional 11.4% of the population is tribal. The predominant religions are Islam, Buddhism, Christianity, and Hinduism. His one complaint was that they were not allowed to celebrate Khmer New Year. I wasn’t clear if the government actually prevented them or if it was because Khmer New Year is technically part of a Buddhist calendar that Muslims shouldn’t follow. But he said that they would get in the car and drive all the way to Phnom Penh for Khmer New Year celebration. It had been a pleasant day and seemed a Khmer refugee story that had a rare, happy ending. But as we were leaving, a woman called me in her shop and asked her niece to speak to me in English, so the others couldn’t hear. Apparently, they were the only Buddhist Khmer family in the small village, and they said that there were a lot of problems between the Buddhist Khmer and the Muslim Khmer. She explained that the Cambodia government obviously wouldn’t help them and the community wouldn’t help them because they weren’t Muslim. “The police ask for money to let them out of jail, but since they can’t pay, they can’t get out. They hold them for five months or more.” Five months in jail, with no hope of release. After five months, the police say they will deport the illegal Khmers. “But they have to pay the travel themselves.” And since they don’t have money, they could get stuck. Some people, she claimed, had been in jail for five years. she worked as a house maid. She knew another Buddhist Khmer girl who worked as a house keeper, and the boss not only didn’t pay her, but also cut her with a knife. The Buddhist family told me that about 20% of the whole Cambodian community is Buddhist and needs help. While she was talking, one of the Muslim men I had interviewed earlier came into the shop, looming, refusing to leave, so she couldn’t tell me anything. Once you become a Malay citizen, some citizens have more rights than others. The Bumiputera, or Sons of the Soil, are the people of Malay race, and they enjoy the most special rights in the country. By these definitions, many of the Khmers we were interviewing had more rights than my Chinese translator who is third generation, born in Malaysia. While the constitution guarantees equality to all of the races, under Article 153 of the Constitution of Malaysia, and the Bumiputra laws, more special rights are afforded to Malays. Thus, a contradictory, dual system is in place which gives advantages to Muslim Malays. A partial list of the special rights afforded to Bumiputeras include: admission to government universities and scholarships, government jobs, Companies listed on the Kuala Lumpur Stock Exchange must be owned 30% by bumiputra. A certain percentage of new housing developments must be owned by bumiputra. A percentage of government mutual funds are set aside for bumiputra, and much, much more. All of the above rights would, in theory, be afforded to Khmer Islam, but not to my translator, Sheung Di. Very much like in Cambodia, however, the Chinese are an ethnic minority, but control most of the private sector economy. They are said to own 40% of the stock market. And Chinese families earn almost double what the average Malay family earns. Racial tensions and legal strife aside, the Khmers in the village survived the Khmer Rouge and now have a new shot at life, with a Malaysian passport. Their lives are better and there is hope for their children.